Something must of came over me. I think I've had more green polishes on this blog in this past month than I've had on this blog's existence. What can I say? I'm liking some greens lately! I think it's because it's the holidays and they're producing more of those deep greens that tend to look better on my skin tone. Holly-Day is a medium forest green creme. 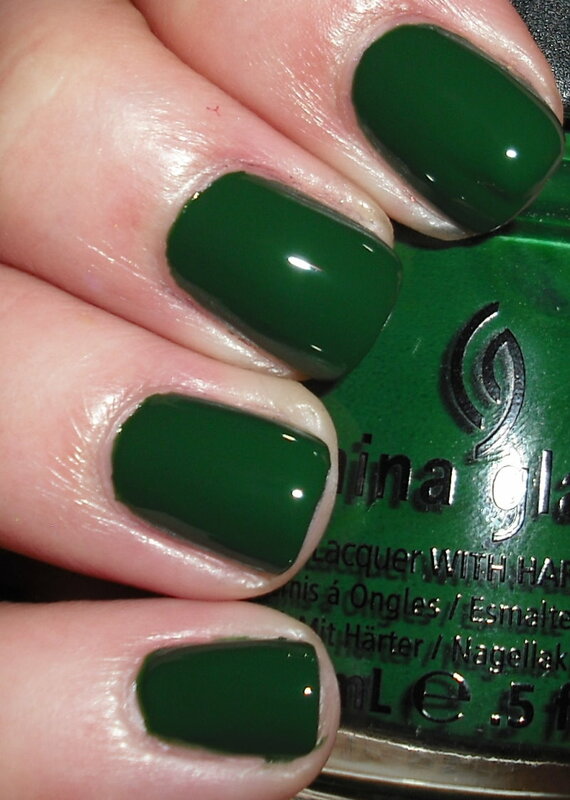 I really love this green! Usually with greens for me they have to be dark and have some type of glitter or shimmer for me to like it. This does not, and I love it. I got this in a set with 2 other China Glaze polishes, and without even giving it a second glance I was going to throw it in the swap pile. I'm so glad I didn't. I'll be keeping this green! This is lovely :) I've been going through the same thing--only with grey! I used to hate it, but now I can't get enough! Thanks! I'm warming up to greens. It's all about finding the right one! Ever since I saw the polish from the Zoya Feel collection I've been getting into a gray phase too. Ooo that would be a cool combination! This green looks amazing on you! It's a very beautiful shade of green. I love this colour. So glad that I got it!! :D Great swatch!